Over the recent years, the Baldwin School has matured into not only an academic program of excellence but also a campus of architectural unity and natural beauty. It is unique in these aspects. The Master Plan attempts to guide the future growth preserving and enhancing these attributes. 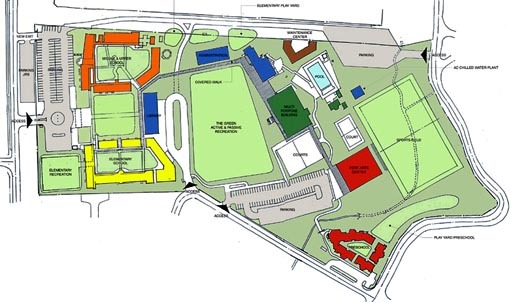 The Master plan is a summary of the consideration of a series of key issues, such as access and parking, academic facilities, support facilities, recreational areas, administrative offices and maintenance. It incorporates the recommendations and conclusions of alternatives into a coherent campus plan. It is based on a clear delineation of activity zones, maximizing internal coordination in each zone and minimizing conflicts of uses. The most radical recommendation in the Master Plan is the possibility of filling the area of the "quebrada". It is a controversial idea as there are strong environmental proponents of leaving it as a green forest. Its use as an athletic field when it is filled is a compelling idea. A true athletic field is necessary for a school of the quality of Baldwin. The existing field is not a real sports area and should not be such in the future. A sports field needs bleachers, night lights, permanent game lines, space for field equipment, a running track, fencing for the containment of games and excellent subsoil drainage, all of which makes it a specialized use area. By developing this type of field over the fill, it frees up the "green" from organized sports activities and allows it to become a play field, and a green lung of the school with sitting areas and landscaping.